Garje Khamtrul Rinpoche's Lineage of Yang Nying Pudri — Tertön Sogyal taught Tulku Apen, who was also the son and student of Tertön Trimé (aka Trimé Ösal Lingpa), a tertön of mind ter and the third lama mentioned in the colophon of the Yang Nying Pudri fire ceremony (Tib. jinsek) text. Tertön Trimé was also the father of Tertön Dechen Namgyal—who was elder than Tulku Apen, and Tulku Atrin (or Trinlé Namgyal)—who was younger. Tulku Apen was the teacher of Khamtrul Rinpoche, and also of Jamyang Khyentse Chökyi Lodrö and Palpung Situ Pema Wangchok Gyalpo. 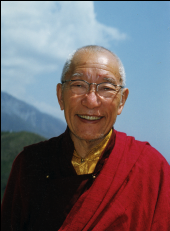 The reincarnation of Tulku Apen was born as Khamtrul Rinpoche’s own son. This page was last edited on 1 August 2013, at 10:01.